På tirsdags morgen våknet vi plutselig til en ny årstid! 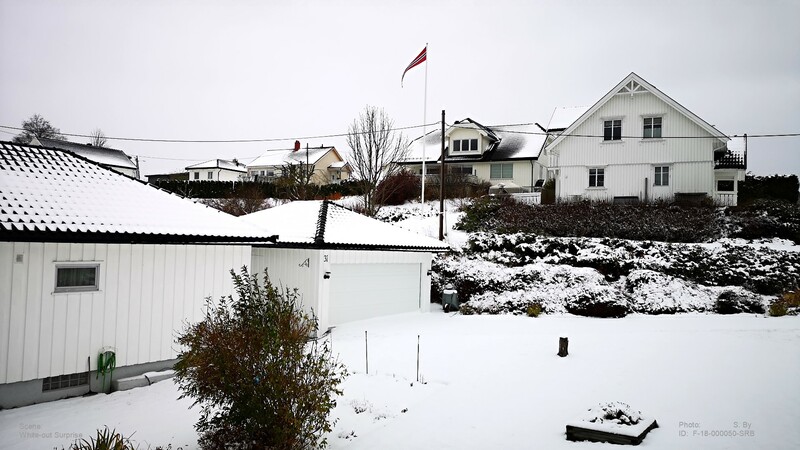 Borte var den siste rest av høst, og selv om høye bjerketrær hårdnakket tviholdt på sine gule blader, så var dette siste advarsel: Gjør dere klar for vinter!!! Her har jeg i full fart tidlig på morgenen sikret meg noen bilder fra nabolaget som viser vinterens første snøfall på ca 6 cm! Evig nok til å forårsake kaos i veinettet. Man skulle tro at vi var forberedt på vinterkjøring i et land som Norge, men – det er alltid noen få som fortsatt ikke har fått tid til å legge om dekk og som ‘bare’ skal en tur på jobben . . .
Og – det er som kjent nok med èn for å skape kaoset! On Tuesday morning we suddely woke to a brand new season! Gone was the last signs of fall, and even if the tall birchs stubbornly hung on to their last yellow foilage, this was the last stern warning: Get ready for winter!!! Here I have hurriedly secured a number of shots from my neighborhood documenting the very first 3 inches snowfall of the season! Enough to create absolute chaos on our roads! You’d think we’d know how to drive on snow in a country like Norway? But – there’s always someone that have found no time to change to winter tyres and – who just had to take a quick trip to the store or the job . . ! And – it does only take one to create the total havoc on the roadnet! 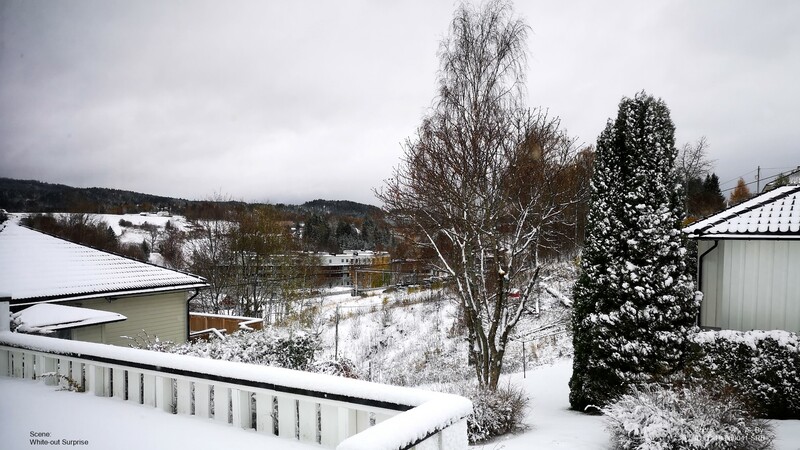 This entry was posted in BUSKERUD and tagged bilde, foto, images, nature, Norge, Noruega, Norvège, Norway. 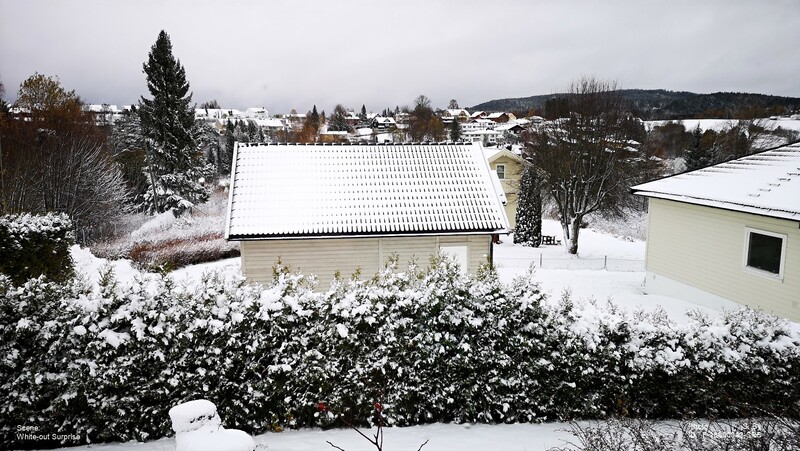 Norwegen, photo, picture, SeeNorway, vinter, white-out, winter. Bookmark the permalink. Ha Ha. I had a VW stasjonsvogn in Oslo in 1971. I remember the delightful terror of spinning around and around down the highway. Kjør siktig! Oh, most Norwegians will most likely cope, but from time to time we have trailer transports on our highways operated by drivers from Russia, Poland, Rumenia or other far away countries beliveing they may traverse Norwegian mountain ranges on summer tyres? And it only takes one lorry to block the roads for hours . 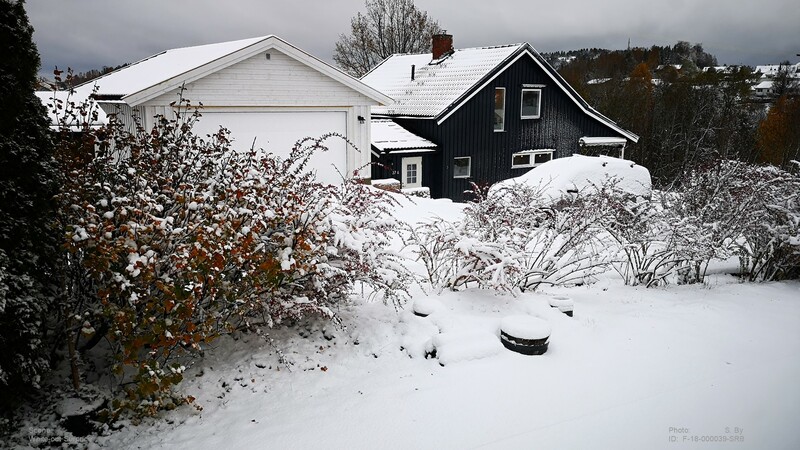 . .
WOW… what a surprise… 🙂 Is this snow early for you in Norway Svein or usual in late October?? It’s hard to tell. Usually we may have snow from mid-November/early Dec., but over the last 4-6 years there have been grave irregularities. A couple of years back the snow came Jan. 7th and the Springb started on Feb 8th!!! But the year before that the snow came in full force early October and remained – rather stubbornly – untill mid-April! You just can’t tell any more! Oh, we’ve had our spells with water even if that mainly happens in the spring. How quick it came…. Looks lovely though! Oh, my! What a beautiful winter wonderland! But it does have its consequences! Oh, how beautiful! Sorry for the chaos on your roads, though.